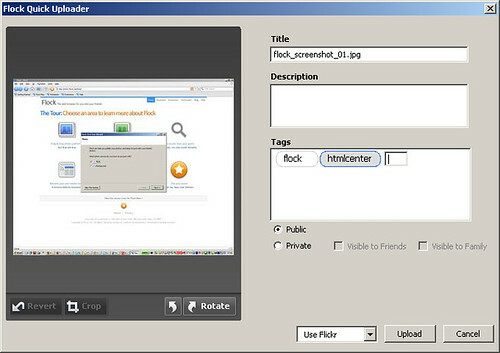 A new kid on the browser block, Flock claims to be a browser which does what Web2.0 is all about: sharing. And there is even better news for developers; Flock is based on Mozilla technologies, which means we won’t have to optimize websites for yet another browser. Now if you say, “Hey, that ain’t all that new!” – you are right. While the concept of sharing through your webbrowser is not new – I also wrote about Allpeers a while back, and Allpeers is the ex-Skype people’s new project (after they sold Skype to eBay) – I reviewed Allpeer’s website today and it still remains a “coming soon” whereas Flock is here now. So starting Flock (after the setup), it prompts me with the usual “default-browser-question”, which I omitted. Then it continues the setup, or let’s call it configuration. Flock’s configuration let’s you integrate all of the Web2.0-goodness: Flickr/Photobucket, del.icio.us, blogs (Movable Type, WordPress, Drupal, …), news feeds and more. So let’s get this review started. It first prompts me to integrate Flickr. It’s pretty smooth, a little redirecting to Flickr, then allowing Flockr to access my pictures – I am certain that even not so web-savvy people can manage the integration process. The next thing to setup are blogs, and I am trying to add HTMLCenter’s blog to Flock – if I could only ever remember my password. The good news here: in case you get stuck – you can always skip. The bad news: here is where I believe I discovered a bug in Flock. Even though my password works from our Movable Type login, it fails multiple times when I try to setup the blog from within Flock (Rhyme!). I used “skip” and moved on to configure are bookmarks – del.icio.us and shadows. Even though I am pretty well versed in the bookmark services, I had not heard of shadows before, which reminds me of another interesting point of Web2.0. They are all aggregators. Most of the time when I check out a new service, I not only discovered this one, but a whole new network of services. This is just a sidenote. To get back to Flock: The del.icio.us integration was easy – I provided a username and password to complete it. Flock will now save all my favorites to del.icio.us – since this is just for testing I enabled this feature. But if I am going to use Flock more often, I would reconsider enabling it because del.ico.us will not just enable sharing with friends, but with virtually anyone out there. I went ahead and skipped on the news setup since I figured that I will just import my own feeds later on. After the configuration, Flock search for plugins and prompted me to install Macromedia Flash – which is kind of convenient since Flash is everywhere, but then again, I wish it came bundled. But at least the install worked! Flock is now ready for use (direct quote), but where do I get started? I went back to the website and went through the tour, which pretty much explains everything about what’s going on with Flock. In my opinion, what is probably the best of all features of Flock is the drag and drop photo publishing. And that’s just because me and my F717 are Flickr crazy maniacs. So let’s assume that I am blogging about Flock with my Movable Type installation on HTMLCenter (real life example). I signed into the blog, opened up the “New Entry” screen and start dragging screenshots from my Desktop into the “Extended Entry” box. Flock then uploaded the picture to Flickr and returned HTML code from Flickr in place so I can use the screenshot in my post. Another notable feature is that Flock has a very clean and stylish interface. Yep, stylish! It looks like stylishness is no longer reserved to Mac OSX users, and I am thankful for it. If you are familiar with the Camino web browser, I think this is what it resembles. 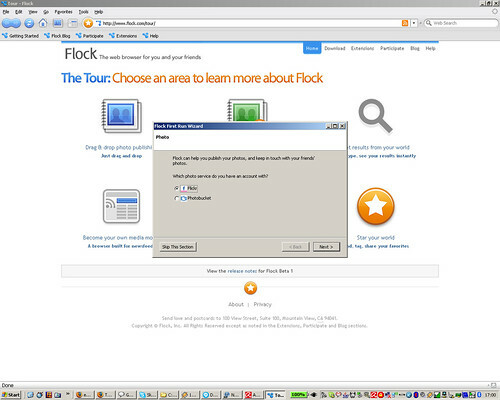 What makes Flock hot as well is that there are already versions for both Windows and Mac (OS X). I hope that as acceptance and userbase increase, they will be able to roll out new versions for either OS, without ditching one for the other. I read a lot of news, and while I skipped this part earlier in the review, I tried to add some feeds to Flock just now. What sounds very convenient is that Flock lets you import a OPML file (also see Wikipedia), which is used for exchanging lists of RSS feeds. So if you current feedreader provides you with one, you are good to go. Flock features extensions – woohoo! Alas I could not find out if it’s compatible with all Firefox extensions, or maybe at least with some (version specifics), since the extension homepage was up and down. Browsing the inventory, it looks like some Firefox extentions have been converted to Flock – e.g. my most favorite “webdeveloper extension”, one to tweak FirefoxFlock’s performance, Adblock and others. So I’ll check up on that later on as time permits and the server allows (it’s down again). Most projects rely on a community who gives feedback and contributes, and so does Flock. Browsing around the website I noticed there is already a fanbase. Unfortunately, due to their rising popularity they seem to have some problems (slow, 404’s, “not working”) with their website but they assured me to get on top of that very soon. So let’s keep fingers crossed. The bottom line is that Flock looks to me like the most promising Mozilla-based browser project as of today. 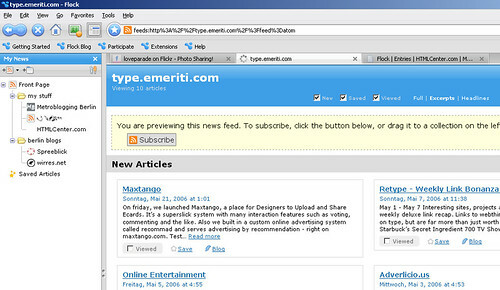 Flock is certainly not perfect, but is at least ten steps up in evolution from the Firefox browser. I will continue to use it, evaluate it and post my thoughts as I go. I think this program has some potential but with everyone knowing “firefox” how do you start to train users to download this instead? Also, if firefox releases an update, will it notify me inside Flock? What about integrating Buzznet and Magnolia??? ?